The World of Althéa: Carry On Crafting! What a week! I have finally finished the tome entitled, Enchanting Recipes of the Past and am at last seeing the light at the end of the tunnel of this quite long stage. This 70 page tome is clearly laid out and has a quick access contents guide to help every player manage their crafting needs. No longer will they have to rummage through many tomes just to find the one recipe to check if they meet the requirements. 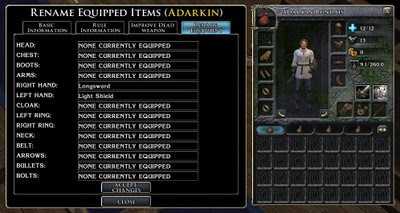 Set out by both category and level, the player will know if they are able to craft a given item in seconds, and easily spot what else they may be able to do as they increase in level. Recipe 11 - Capitalised Gold Necklace tag in 2da and added DIAMOND to recipe description. Recipe 94 - Corrected Craft Alchemy to 3 to match description. Recipe 116 - Added Silver Battleaxe recipe. Recipe 146 - Added Silver Dagger recipe. Added sfx_conj_magic to sound for all Incantations. Incantation 24 - Made level required 6 as per recipe description. NB: Let me know of any other "errors" that would be worth knowing about! If this variable is set to true, then the hammer can be used to touch an item and the rename GUI text box appears. I am in two minds as to whether to include this option or not though, as it could be dangerous if a player was to rename an item that I have set script to check. It's ability to rename items is indiscriminate at the moment, but I may change it to check for items worn, like my own script currently does. This would then allow a player to rename items a couple of ways. As most players will probably know, the Enchanter's Satchel allows the PC to craft items in the field without the need to have access to a workbench. However, in the Althéa Campaign, this item requires the PC to use one more item in the process: Life Essences. Regular readers of this blog will know that the Life Essence will play a prominent part in the campaign and is an item that can be used in many ways and so it will be up to the player if they want to take advantage of crafting in the field using the Enchanter's Satchel and expending Life Essences. Alternatively, they can just wait until they have access to a magician's workbench where they can craft without any Life Essence requirements. On the back of a previous post, I also took the trouble to rename all the molds to show at a glance what the minimum Craft Armour or Craft Weapon skill had to be to use them. E.g. Mold(CA1): Light Shield and Mold(CW2): Club, require a Craft Armour skill of 1 and a Craft Weapon skill of 2 respectively to create these items with the most basic of materials. (*) ADDITION: I will also be adding a level indication for all newer (SoZ) recipes as an indicator of what minimum level is required to craft an item. The figure will either represent the lowest rank in the appropriate skill or the lowest caster level for the catalyst spell used in the recipe description. E.g. Recipe(8): Amulet of Health +2 means the lowest caster level is 8th level as a catalyst spell is used here. Recipe(8): Acid Flask means the lowest Craft Alchemy skill rank required is 8 points. I am now looking at writing at least one more book for crafting. This book will contain all the recipes that use the greater essences (brilliant and pristine) at a glance. Again, the idea is to take away the need for the player to rifle through various collected essences to find a recipe they wish to follow. Essence description will be made much simpler, and the prospective crafter will refer to the tome instead when wanting to see what is required for crafting with these essences. I had considered a possibility of a third tome that covered the new style recipes that come with the SoZ expansion, but due to the way they are gathered already (as if in their own tome), I decided against it. ADDITION: See the comment above regarding SoZ recipes under "Mold Information". I am also going to make the usage of Enchantment Recipes single use only. Therefore, finding and collecting more than one of the same recipe (which can be done) will be beneficial rather than sit inside a tome alongside a duplicate that does nothing more than duplicate the same information. Making these recipes single use only feels more appropriate to me, especially as there are other ways to craft items available. UPDATE: I have decided to make the Creation Recipes single use only as well. As these recipes greatly reduce the requirements to create certain items at the cost of only a small amount of gold, I considered that these should be "consumable" during item creation as well. 1) Treasures Bag: Gems and jewellery automatically go into this bag. 2) Crafting Satchel: Some may know this as the Bounty Bag, but I have renamed it as it will accept a number of other crafting ingredients as well now, like molds. There may be times when an item is not automatically placed in the bags, such as when a piece of magic jewellery is made. Furthermore, I have made it so items can be removed from the bag again if need be. This may be obvious, but was not the case in practice. Hopefully, I will have the energy to fix it when the parts turn up next week. hyeah, it was only after you pointed it out in the other post and I started looking at it, I saw what a slog it was going to be. I noticed the GP costs aren't filled in too for everything, so not sure if that needs looking at. I have been perservering through this to get to the end of it, but I alays find just one more niggly factor thatI want to "fix". Hopefully, the GP values that you mention are not filled in for redundant recipes (not required or finished off by Obsidian) and so won't matter. However, as I have already discovered a number of "errors", then I won't count it as truly finished until it has been thoroughly tested, which may not come until beta testing or even actual play testing when someone reports it. That's why I hope some players of SoZ will report any errors they find along the way for me to correct as they do. In the meanwhile, I also fixed the Alchemist Fire script which was also broken. The problem is, the crafting code is quite deeply buried and I don't really want to mess with core include files unless I really have to. Hopefully there wil be a way to check and work around these scripts with my own code. I'm curious about this tome you made. Is it an in-game tome or a document that players can download from, say, the Vault? If it's an in-game tome with 70 pages, it would be really interesting to see some screenshots of it. The advantage of doing it using this hak, is that it is *much easier* to read than from an "examine" page. It is just like reading a book!